Maximizing human performance is about making consistent improvements and becoming 1% better every day. We know that following a science-backed method works and it is our goal to help O2X athletes not only maximize human performance on the job, but also create healthy habits that stick for life. Our mission is maximizing human performance through world class training and education. Interested in an O2X Event? Suicide is the number one cause of death among police officers. O2X teaches stress management and resiliency-building techniques that help police and other tactical athletes optimize their behavioral health. “Health and Fitness in Law Enforcement: A Voluntary Model Program Response to a Critical Issue,” CALEA Update Magazine, 2005. A Harvard Medical study found 40% of active-duty officers suffer from sleep abnormalities including apnea, insomnia, shift work disorder, and narcolepsy. These abnormalities increase vulnerability to depression, obesity, heart disease, and diabetes. 44% of job-related injuries result in loss of work time, impacting entire communities. O2X Human Performance’s mission is to help tactical athletes create sustainable changes so they can finish their careers as strong as they started. The program offers workshops, and ongoing education to improve quality of life for firefighters and diminish unnecessary costs for their departments. 53% of fireground injuries are attributed to strains, sprains, and muscular pain. O2X provides physical conditioning training focused on pre-habilitation and overall fitness. Our program helps decrease firefighters’ risk of injury and increases their rate of recovery. Over 1/3 of firefighters report suffering from career-related PTSD. O2X teaches stress management and resiliency-building techniques that help firefighters optimize their behavioral health. In 2015, 51% of firefighter deaths were due to cardiac-related events. O2X offers a unique Eat, Sweat, Thrive curriculum focused on nutrition, conditioning, and resiliency to combat health risks of cardiac stress. Firefighters are 2.5x more likely to be diagnosed with cancer than the general population. O2X’s science-backed methodology specifically addresses firefighters’ exposure to carcinogens and offers strategies to mitigate long-term risk. Police officers incur over 4 times the rate of occupational injuries resulting in loss of work time than the general population. Law enforcement agencies estimate an in-service heart attack cost departments anywhere from $400,000 to $750,000. 70% of police injuries resulting in loss of work are attributed to tears, sprains, pain, contusions, fractures and tendonitis. O2X provides physical conditioning training focused on pre-habilitation and overall fitness. Our program helps decrease tactical athletes’ risk of injury and increases their rate of recovery. 85% of soldiers tested in a recent study were shown to have some type of sleep disorder, and 42% reported sleeping fewer than 5 hours per night. The O2X curriculum is tailored to the unique demands on tactical athletes, including training blocks on sleep hygiene and recovery, taught by sleep science specialists and physicians. In 2012, over 6,100 military personnel were discharged because of failure to meet physical fitness standards outline by their Service. O2X’s mission is to help tactical athletes create sustainable changes so they can finish their careers as strong as they started. The program offers workshops, and ongoing education to improve quality of life for tactical athletes and diminish unnecessary, preventable costs on health care. Defense Health Board. (2013). Implications of Trends in Obesity and Overweight for the Department of Defense. Defense Health Board. O2X provides nutrition training and education focused on ensuring tactical athletes learn the importance of quality, quantity, and timing and how to fuel properly to maximize performance. Nearly 5%-15% of service members are affected by PTSD, this has been found to be the most prevalent mental health disorder in deployed service members studied. 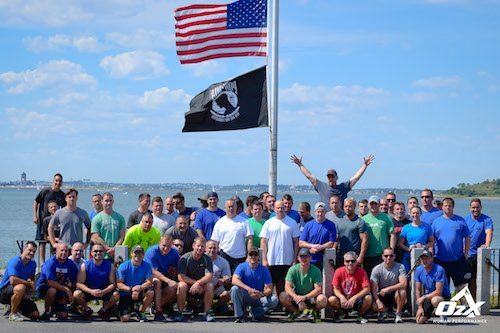 O2X teaches stress management and resiliency-building techniques that help tactical athletes optimize their behavioral health before, during, and after deployment. American Psychological Association. The Mental Health Needs of Veterans, Service Members and Their Families. Education Directorate: Government Relations Office. Government Relations Office. Karney, B. R., Ramchand, R., Osilla, K. C., Caldarone, L. B., & Burns, R. M. (2008). Invisible Wounds: Predicting the Immediate and Long-Term Consequences of Mental Health Problems in Veterans of Operation Enduring Freedom and Operation Iraqi Freedom. RAND: Center for Military Health Policy Research. RAND Health. One study reported that 82% of all injuries sustained by a cohort of U.S. Marine recruits were lower extremity injuries; and, overuse accounted for 78% of the injuries. Almeida, S. A., Williams, K. M., Shaffer, R. A., & Brodine, S. K. (1999). Epidemiological Patterns of Musculoskeletal Injuries and Physical Training. Medicine & Science in Sports & Exercise , 31 (8), 1176-1182. “O2X provided a great learning experience both mentally and physically. Having been an athlete, martial artist and training most of my life, I am always trying to find ways to improve. This has been increasingly important as am in my 40’s now and want to maintain the physical activities I love. As I have gotten older I have realised the importance of proper training, sleep and diet. The O2X workshop provided all of these answers and more.